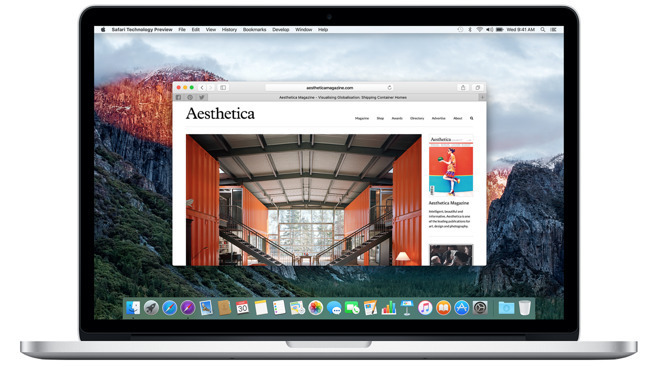 Apple issued beta versions of Safari 10 for OS X 10.11 El Capitan and OS X 10.10 Yosemite on Thursday, granting developers access to new features like enhanced Safari Extensions, a redesigned Bookmarks interface and more. Available through Apple's developer website, Safari 10 for OS X Yosemite and El Capitan presents an opportunity for those unwilling or unable to download the recently released macOS Sierra beta a chance to test out the next-generation web browser. Safari 10 will come bundled with Apple's new Mac operating system later this year. In addition to the above, those evaluating the software on OS X 10.11 El Capitan are asked to concentrate on development of Safari App Extensions and Spotlight suggestions for top search bar hits. Apple introduced Safari 10 at the Worldwide Developers Conference earlier this month, highlighting key features like picture-in-picture video viewing and "Buy with Apple Pay" web transactions. These more advanced features will be exclusive to macOS Sierra and are therefore not available in today's Safari betas. Developers can download the latest Safari 10 beta by visiting Apple's Developer portal.